We’ve selected 19 of our favorite roller coasters that are celebrating their 20th anniversaries this year, and will profile them every other Thursday for the next several weeks. This week we’ll be taking a trip to Six Flags Great Adventure to talk about yet another Bolliger & Mabillard coaster, the floorless coaster Bizarro. The addition of Medusa gave the park it’s 13th coaster, which was the most of any theme park on the East coast at the time. Being the world’s first floorless coaster, Medusa gave riders a thrilling new way to experience coasters. The ride type was similar to existing sitting B&M coasters such as Kumba at Busch Gardens Tampa. The main difference was that, upon loading, the floor of the station gave way, leaving the riders seated elevated and completely open on top of the track. Many publications described the experience as giving the sensation of being in a flying chair. Although riding with your feet dangling had already been done with inverted coasters, unlike these coasters, floorless coasters’ views are not restricted above by the track. 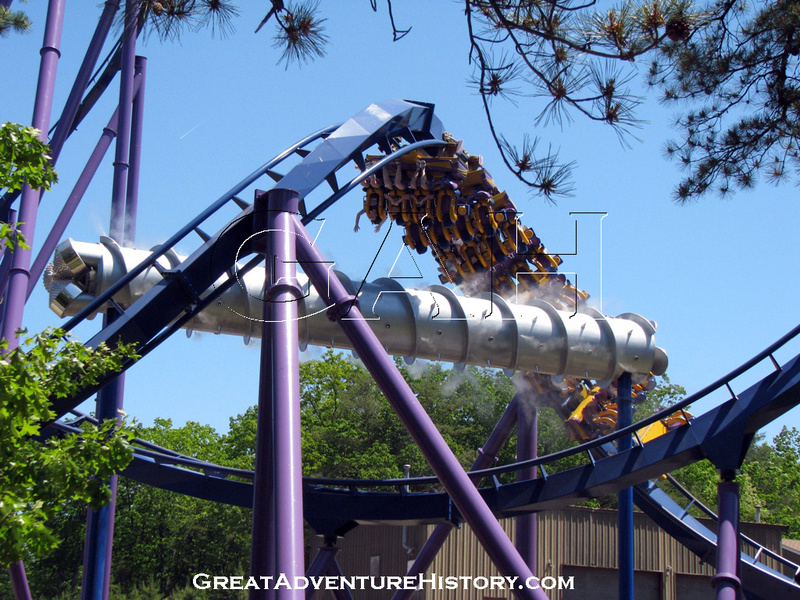 As far as ride experience goes, Medusa had a similar track layout to Kumba, with seven inversions that include a vertical loop, dive loop, zero-g roll, cobra roll, and interlocking corkscrews. 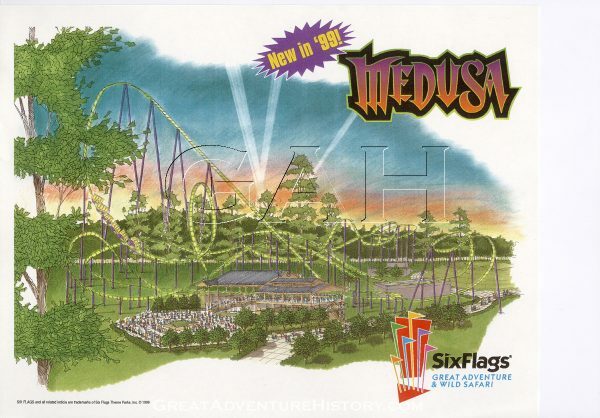 In October 2008, Six Flags announced that Medusa would be redesigned for the 2009 operating season. On April 1, 2009, Six Flags announced that Medusa would be changed into Bizarro and incorporated into Six Flags’ DC theme. Designed to be an anti-Superman clone, the DC Comics character Bizarro is completely unpredictable, doing the opposite of all human behavior. Bizarro has similar powers to Superman, although often with opposite effect. For example, instead of having heat vision and freeze breath like Superman, Bizarro has “freeze vision” and “flame breath”. These elements would be incorporated into the redesign of the ride. Six Flags revealed the story of Medusa’s conversion into Bizarro through a series of comic book-styled panels located along the ride’s queue. According to the story, Lex Luthor plots to build a “Wormhole Ray” under a LexCorp dummy corporation called “Clawshun Industries”. Daily Planet photojournalist Jimmy Olsen uncovers the link between Clawshun Industries and LexCorp, but is captured by LexCorp scientist, Dr. Teng. Olsen attempts to contact Superman using a signal watch, but Dr. Teng snatches it and attempts to use the watch to lure Superman into a trap with the Wormhole Ray. 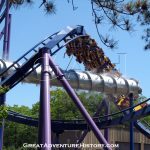 However, things go faulty and the Wormhole Ray fires a purple bolt of lightning that splits into two, striking both Superman: Ride of Steel at Six Flags New England and Medusa at Six Flags Great Adventure, converting both rides to Bizarro and summing Bizarro himself from “Htrae”. For Medusa, nothing physically changed in the ride’s track layout. However, along with a new vibrant blue and purple paint scheme, several visual and special effects were added to the ride. A series of gold Superman shields were added around the track at the bottom of the first drop, along with the addition of a cool mist effect, to simulate Bizarro’s “freeze vision”. 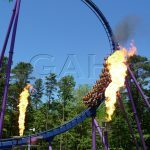 Next, a pair of flame jets were added at the sides of the ride’s dive loop to simulate Bizarro’s “flame breath”. 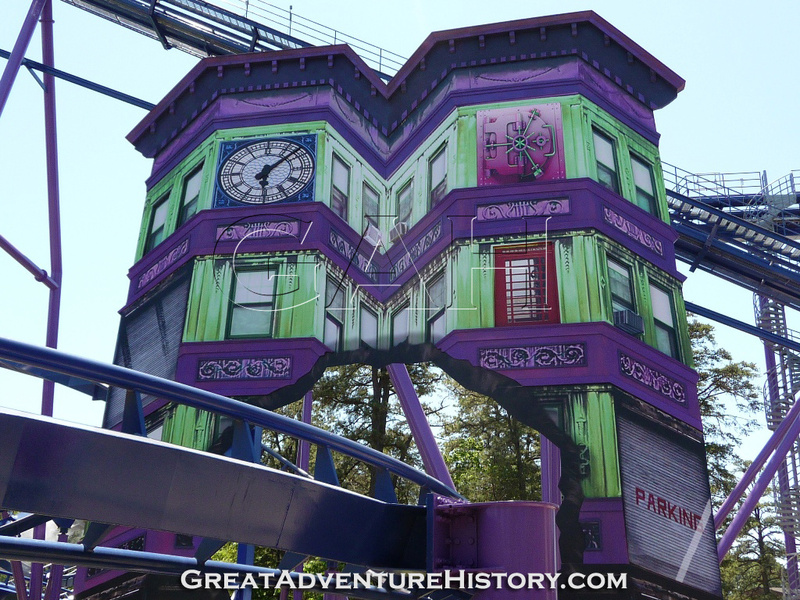 After the brake run, several building facades from “Bizarro World” were added, with a few “near misses” as the train passes close to and through them. Additionally, the “auger of doom” (a weird steaming, spiky drill device is the best way to describe it) was placed in between the interlocking corkscrews, adding a headchopper effect. There were also several lighting effects added at various points of the ride. A sound system was added to the ride trains to accompany the added visual effects. The sound system featured music, sound effects, and random movie quotes from various points of pop culture timed to the ride’s elements. The clips made absolutely no sense collectively (for example, Gandalf’s famous “YOU SHALL NOT PASS!” line from The Lord of the Rings belts out as you encounter the first drop), but this was to be expected given the new theme of the ride. Other clips include “Game over, man!” from Aliens and “Wheels on the Bus”. The ride ended with Bizarro declaring “BIZARRO NUMBER ONE!” followed by a techno song with “Bi-zar-ro, Bi-zar-ro” repeated along. The ride’s sound system was removed in 2013. 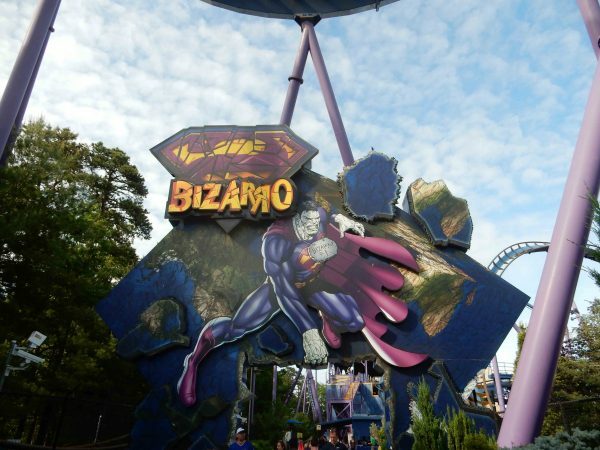 Bizarro currently is the only ride that retains the Bizarro conversion, as the Six Flags New England coaster was reverted back to Superman to go along with the popularity of Man of Steel and Batman v Superman: Dawn of Justice in theaters. As B&M’s first floorless coaster, Medusa/Bizarro proved to be popular amongst fans. The ride would spawn the creation of several more floorless coasters, including Superman: Krypton Coaster at Six Flags Fiesta Texas, Medusa (Bizarro’s sister coaster with a sea-serpent roll instead of a cobra roll) at Six Flags Discovery Kingdom, Kraken at SeaWorld Orlando, Scream! (Medusa’s mirror image) at Six Flags Magic Mountain, and Dominator at Kings Dominion. 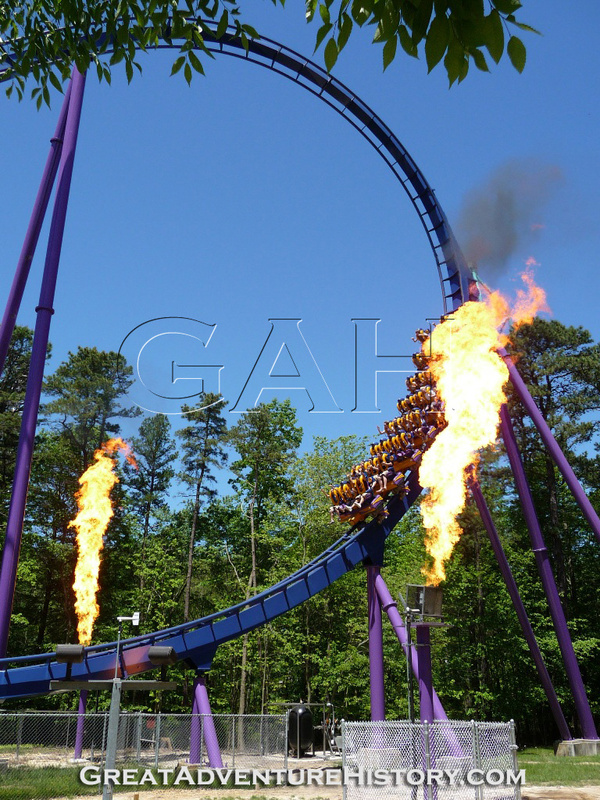 Recently, B&M has been converting several of its stand-up coasters into floorless coasters. This includes Rougarou (formerly Mantis) at Cedar Point, Patriot (formerly Vortex) at California’s Great America, and Firebird (formerly Iron Wolf and Apocalypse, currently under construction) at Six Flags America. What are your thoughts on Medusa and its conversion into Bizarro? Feel free to share your thoughts below! 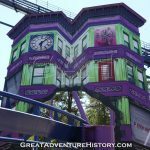 For more information about Bizarro, be sure to visit the Six Flags Great Adventure website, and to follow the park on Facebook, Twitter, and Instagram. “19 for ‘99” continues in two weeks with our next coaster: BuzzSaw Falls at Silver Dollar City!